Way back in 1979, the firm I began working for, W Stonier & Sons Ltd of Goldenhill, Stoke on Trent took delivery of their first Leyland National. 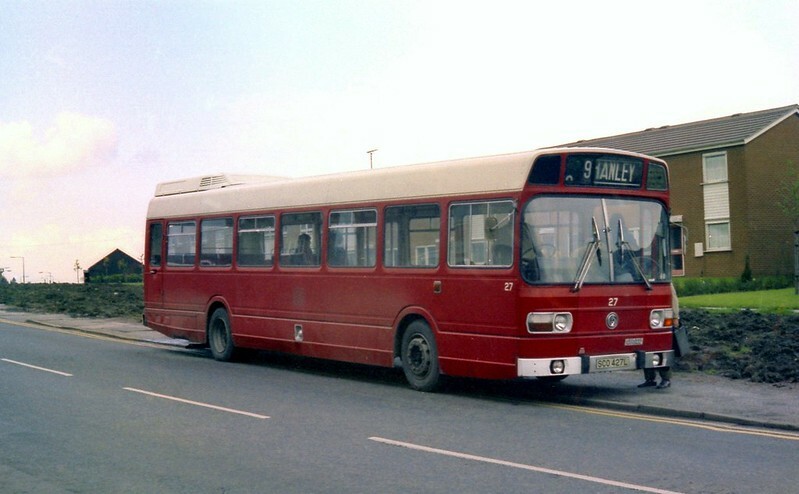 Stonier's had been bought by Jim Berresford and his wife (of Berresford Motors, Cheddleton fame) in 1976 and had been the recipients of several 'modern' second hand buses as a result. The flip side was that Stonier's had a new Willowbrook saloon on order and reliable sources say there was a Northern Counties bodied Atlantean also, but in the event they didn't arrive... or at least the 'decker didn't. JAB's viewpoint was that new coaches could be justified, but new buses couldn't. Anyway, as illustrated above, a youthful ex Plymouth City Transport Leyland National, SCO 427L arrived on approval from a well known Essex dealership as a possible lead to more. In the event, it didn't behave too well, but was never the less popular with crews who'd been used to manual gearboxes and no power steering. Before too long, it expired one night in Cobridge with a seized engine and was never repaired, it's hulk surviving in Parsonage Street yard almost until closure. About the same time half a dozen ex Greater Manchester AEC Swifts arrived (3 for Stonier's, 3 for Berresfords) which gave infinitely better service. Back to the picture ... it was taken at shift change opposite the old garage in High Street Goldenhill. Early 'A' board gave way to Late 'A' at about 2.35pm, a diagram which saw the bus in service from about 6am to midnight all told.